This Pole Mounting Bracket is for Exhibiting (1) 18"w Flag! Custom Banners are Also Available! Each Pole Mounting Bracket is Inexpensive! Bandings are 40" long to fit around most lampposts. Pole mounting bracket is made of cast aluminum and is rust resistant for long term use. Zip ties and pole pins hold the flags to the brackets securely. Wind tunnel tested to reduce 87% of the wind load. 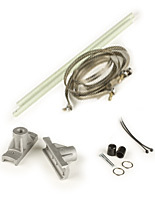 This street flag hardware kit is a pole mounting bracket that is rust resistant which is important for outdoor use. These sets come with (2) banner rods, (2) brackets, (6) screw gear bandings, (2) pole pins, (2) zip ties, & the installation instructions. 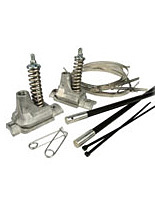 This pole mounting bracket hardware kit is made for holding street flags. These banner accessories are for (1) 18"w flag. 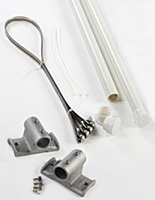 Each street banner hardware kit is a pole mounting bracket that fits most standard lampposts. The screw gear bandings are long at 40" which will fit a standard street light post up to 12.75" in diameter. A pole mounting bracket that exhibits (1) flag is often used in downtown areas, on college campuses, and in large shopping centers. These banner brackets are great for promoting special parades or fairs, holidays, and welcoming the seasons. Each pole mounting bracket is presented at a great price. The low price point does not mean they are not high quality. These are some of the best brackets sold on the market today especially in terms of durability. The main reason these are so affordable is that they do not have the "on-pole adjustment" feature, however they can be adjusted by loosening the bandings and repositioning on the post. This pole mounting bracket has been wind tunnel tested (see report below) to reduce 87% of the wind load. The fact that these have been tested for high winds gives buyers peace of mind that they will last in various elements. 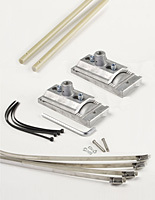 Each pole mounting bracket, called a flag hardware kit, will work with either vinyl or fabric banners. These lamp post flag hanging accessories are very eye-catching since they sit above ground level and passerbyers will easily see them when driving or walking past and from a distance. Each pole mounting bracket for outdoor use comes with all the hardware needed for displaying a custom banner, users just need to provide the actual flag. These lamppost accessories are made of highly durable cast aluminum with fiberglass banner poles. 3.3" x 6.9" x 7.3"
Please add 3 business day(s) when determining the lead time.